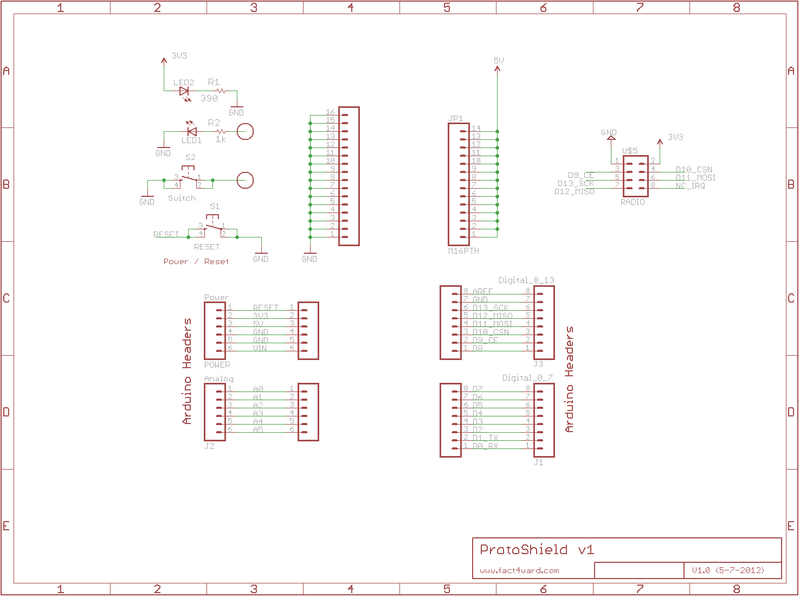 This is a NRF24L01plus shield with a special connector for this module. Have a look what is available in the shop. It still retains the features of the normal prototype shield such as a power LED and a switcheable LED. In addition there is a reset switch and a switch which can be connected to an input pin. 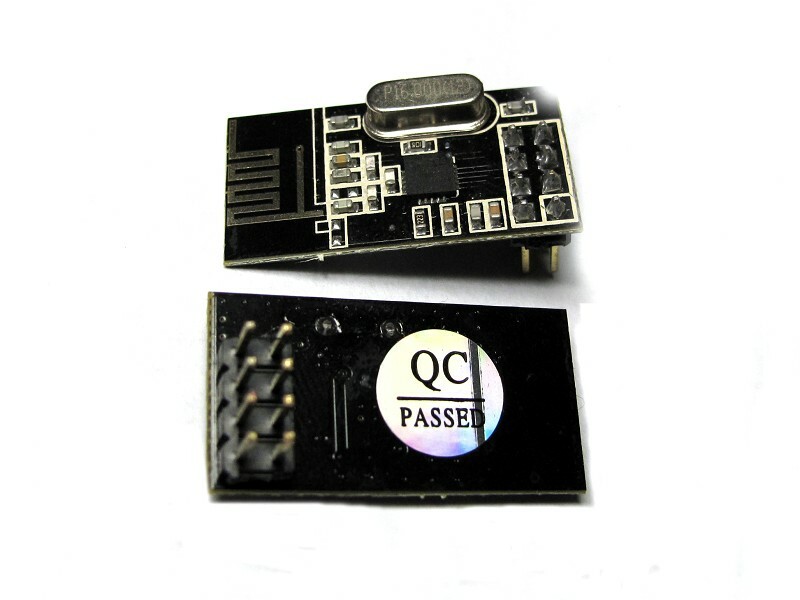 The Nordic nRF24L01plus is a highly integrated, ultra low power (ULP) 2Mbps RF transceiver IC for the 2.4GHz ISM (Industrial, Scientific and Medical) band. With peak RX/TX currents lower than 14mA, a sub μA power down mode, advanced power management, the nRF24L01plus provides a true ULP solution enabling very low power consumption for battery operated solutions. The Enhanced ShockBurst™ hardware protocol accelerator offloads time critical protocol functions from the application microcontroller enabling the implementation of advanced and robust wireless connectivity with the arduino. The Nordic nRF24L01plus integrates a complete 2.4GHz RF transceiver, RF synthesizer, and baseband logic including the Enhanced ShockBurst™ hardware protocol accelerator supporting a high-speed SPI interface for the application controller. No external loop filter, resonators, or VCO varactor diodes are required, only a low cost ±60ppm crystal, matching circuitry, and antenna. Main functionality is to have two arduinos communicate with one another which is what most of the examples refer to. With nthis version its simply a matter of plug and play. 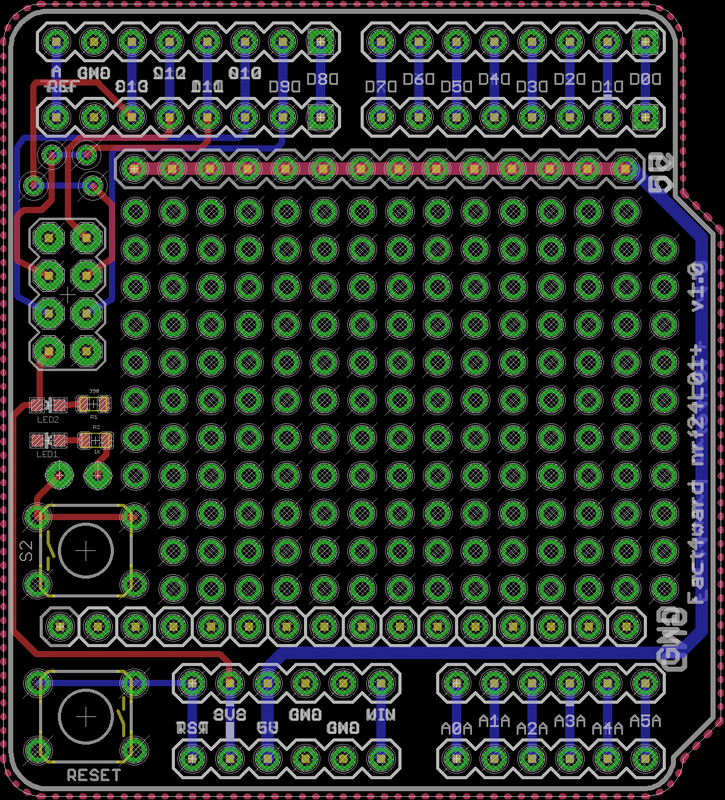 The NRF24L01plus module plugs into the shield and all the pins are connected through to the correct arduino pins.